We survived Rick Grimes’ final episode and it was an intense, explosive ride with a bittersweet ending. Episode 5 of The Walking Dead season 9 started off with Rick facing his season 1 pilot episode self in the Atlanta hospital. It was the first of several dream sequences and primarily pointed out his increased hotness over the years. And, it was kinda a dead giveaway for how his TV arc would end when he saw crows (usually a death symbol) turning into helicopters (a symbol of hope and survival). But, the moment didn’t last long because Rick snapped back to reality and managed to pull himself up off of the metal rod with his belt like a complete boss. Those survival instincts are STRONG. Generally speaking, the dream sequences gave the fandom all the feels with appearances from Shane, Herschel, and even Sasha. At first, I was honestly surprised about Sasha in this lineup of people from the past to motivate Rick towards surviving at all costs. It would have been expected to see Glenn or even an appearance from Carl as Rick reflected on his life. But, after seeing Rick and Sasha’s interaction, it made sense because Sasha felt like she had served (and completed) a specific purpose in the group. She told Rick that he fulfilled his destiny by giving them hope, strength, and solid leadership toward building a better future. Therefore, it was okay for him to let go because he had laid the foundation for a better tomorrow. It was nice to see Sasha again, but the scene would have had more emotional weight from Glenn. I understand that Steven Yeun probably won’t make another The Walking Dead appearance, but still. Sidenote: This show has a long history of bad Black people wigs and Sasha’s wig was particularly offensive because it looked nothing like the natural hair she rocked on the show. There wasn’t a Black fan alive who didn’t laugh at that tragic Party City hairpiece. But, I will move on. The lead-up to Rick and Sasha’s encounter was very strange with Rick wandering the Atlanta hospital walls and seeing an updated version of the “Don’t Open, Dead Inside” sign that crossed out “don’t” and replaced inside with outside. There were also several voices asking him what his wound was, one of which sounded a heck of a lot like Abraham. The flashback with Shane in the police car (complete with burgers and fries) was a solid moment. Jon Bernthal is totally The Punisher to some fans now, but he managed to tap back into Shane’s deep Southern accent and brash personality. I loved how Shane mentioned Rick’s ruthless moments like slaying Gareth in the church and biting a man’s throat out. Those actions were undoubtedly the “Shane” in Rick and incidents that Shane would have loved if he was still alive. Shane gave Rick the motivation and fire to fight like the boss he has been for several years. And, the tears flowed when Scott Wilson had his final moment with Rick. 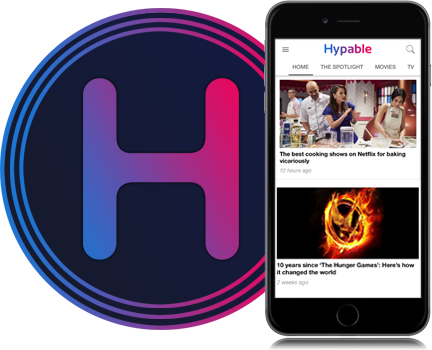 The scene’s poignancy and sadness was amplified by the actor’s recent death as Herschel brought his usual wisdom in the mix when he assured Rick that he has nothing to apologize for and is on the right path. 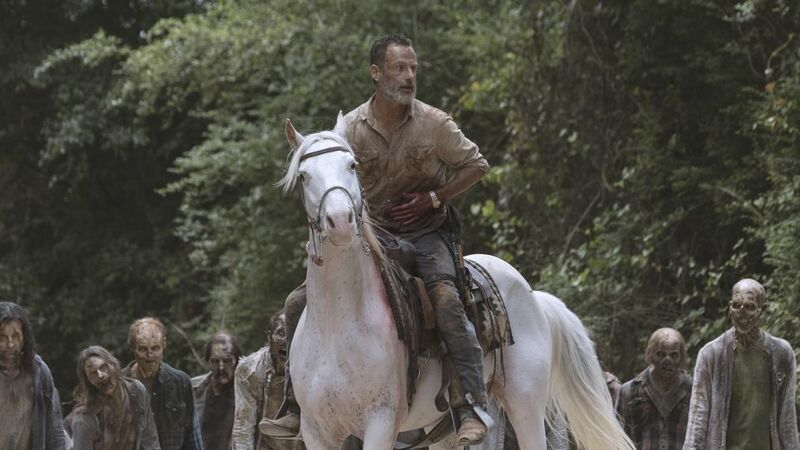 Each of these visions ended with a jarring shock back to reality as Rick woke up in an abandoned home with walkers in his face and randomly on the camp grounds as that dumb White horse abandoned him (again). The flashbacks were a nice review of all he had been through, but it would have been powerful to get together as many of the deceased characters as possible in one scene to rally Rick on this journey. And, how could Rick have voices in his head without hearing Carl saying Dad?! As usual, Andrew Lincoln smashed it as Rick Grimes. The moments of him shooting walkers while clutching his side and scrambling to stay alive made me hold my breath in fear. The slow buildup, profuse bleeding, and agonizing proximity of walkers had everyone in a social media frenzy as they wondered what would happen to Rick. It took a while but he finally made it back to the bridge and was about to pass out once again when his crew came rolling in to slay the walkers. As Michonne leaned down to talk to him, it didn’t take long to figure out that it was yet another dream. She told him everything would be fine and he had to survive for her, which gave him the final push to get across the bridge. By this point, fans’ anxiety was through the roof because they wanted something to just go ahead and happen. Most of his scenes were of him groaning in pain and trying to stay one step ahead of walkers in the midst of passing out. And, the only other action we had gotten was a short-lived face-off between Maggie and Michonne about killing Negan, to which Michonne relented when Maggie asked her how she would feel if Rick was on the receiving end of Negan’s bat. And, that didn’t even pay off because Maggie saw a malnourished Negan begging to die so he could meet Lucille (his wife and baseball bat) in heaven. It was well-acted, but also taking precious minutes away from watching Rick’s plight. I breathed a temporary sigh of relief when all of the core crew (Michonne, Daryl, Maggie, Carol, Rosita) and others showed up but the good feeling was over quickly. They were completely overpowered and virtually helpless as they tried to find a way to save Rick, who was just on the other side of the bridge. The only person who stayed stationary was Daryl, who shot arrows at the walkers that got close to Rick. Rick got a chance to look at the love of his life and his long-term friends one last time before he lifted his gun and shot into some explosives on the bridge to prevent the walkers from taking out communities. The subsequent explosion and collapse made me gasp in horror because all signs pointed to Rick being dead. Social media cries of NOOOOOO and RIP RICK rang out by the thousands as we watched an outpouring of tears and emotion from Maggie, Daryl, and Carol. But, Michonne’s reaction was the ultimate gut punch in this moment. It was absolutely heartbreaking to see her crumple to the ground in tears after watching Rick made such a horrific decision. And, it was kind of odd to see Maggie comfort her after she had just posed the question of what Michonne would do if Rick died in front of her eyes. Awkward. It was also sad to think about Judith back at Alexandria and unaware that her dad had sacrificed his life to save his nuclear and extended family. Except…he’s not dead. Jadis proved to not be such an awful person after all as she rode around in the RV last seen with Tara and the mysteriously missing Heath. She spotted Rick, who was still bleeding but otherwise looked the same. Ummmm…how did Rick survive this explosion without losing any limbs or being somehow injured or burned in any way? Plot armor. Most fans were so excited to see Rick survive this unthinkable situation, but others thought it would have been better to have him go out in the blaze of glory like a badass. Personally, I have mixed emotions about this decision. I love Rick, so I was happy to see him survive, but I don’t like the prospect of Michonne having to deal with raising Judith alone. The fact that she doesn’t know what really happened to him will continue to nag me for the rest of her time on the show. And, I didn’t mind the way he chose to go out because it was a very “Rick” thing to do and he would have died with the chance to see his crew together one last time. Jadis calls the helicopter and tells them that she has an injured “B” to help her get a ticket out of town. Walking Dead fans wondered how the heck Rick could ever be a “B,” but it was quickly overlooked because Rick was alive and stabilized in the helicopter. There still aren’t any answers about who this group is and what these letters mean, but at least Rick didn’t die, right? It wasn’t really seen as a fake-out death (like Glenn’s dumpster adventures) because the resolution came pretty quickly after the explosion. Wang Chung’s “Space Junk” played as Rick came to his senses and was airlifted to parts unknown, which was a callback to when they used the same song at the end of the pilot. And…that’s still not all. Several years have passed and a group (whom we will know as Magna and her crew) is in the thick of walkers in the same field when they are saved by a kid named Judith. Judith Grimes. She uses her whole name like her father and appears to be resourceful and cool as a cucumber like her mom Michonne. This raised the antennas of many fans, who thought it was cool to see Judith rock her katana and the hat, which signals that she may take on Carl’s story from the comics. The show released sneak peeks at upcoming episodes in which Michonne hints that she will never give up. 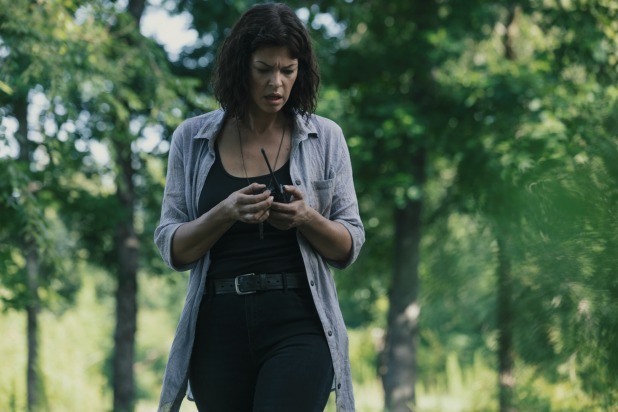 There’s no specifics on what she means, but it can be assumed that she believes Rick could somehow still be out there since they didn’t find his body. It’s a weird train of thought because who the heck would think he possibly survived that explosion at all. And, the prospect of Rick being away for SIX YEARS made most fans call BS on this time jump choice for a couple of reasons. First, why would Rick stay away from his family for so many years? It would make sense for him to take several months or even a year to fully recover, but Rick would do anything to get back to Michonne and Judith ASAP. I honestly think he would jump on a raft and sail the ocean to get back to the people he loves. The only logical explanation would be if Rick has somehow lost his memory after the explosion and his subsequent fall to lower ground. Or, perhaps he is being held hostage in some way. Thankfully, fans will get an answer to this question in the future. Scott Gimple announced on The Talking Dead that there would be three AMC Rick movies to cover his new adventures with the helicopter people. It’s bittersweet because the fandom loves Andrew Lincoln/Rick Grimes, but it is also sad to see him have this story while everyone at home thinks he is dead. It’s also a great opportunity for Rick to make an appearance on the show again at some point in the future to reunite with his people. Right now, Andrew Lincoln is pretty burnt out with the role and it’s easier for him to spend time with his London based family by just doing movies, but perhaps he will change his mind down the road. If that happens, hopefully it will take place before pretty much everyone he knew dies. But, the good is outweighed by the potential bad from this helicopter rescue arc. It means that Jadis, who is generally disliked among the fandom, will likely be a part of this movie. Yeah, she gets points for helping to save Rick, but I don’t like the prospect of her and Rick starting a new life in a community together. AMC better not try to make them a thing because the fandom disapproves, including those who never got into the Richonne relationship. The Rick & Jadis adventures are a story that literally no one wants to see. As a matter of fact, make the movies about Rick’s journey to get back to Virginia please. 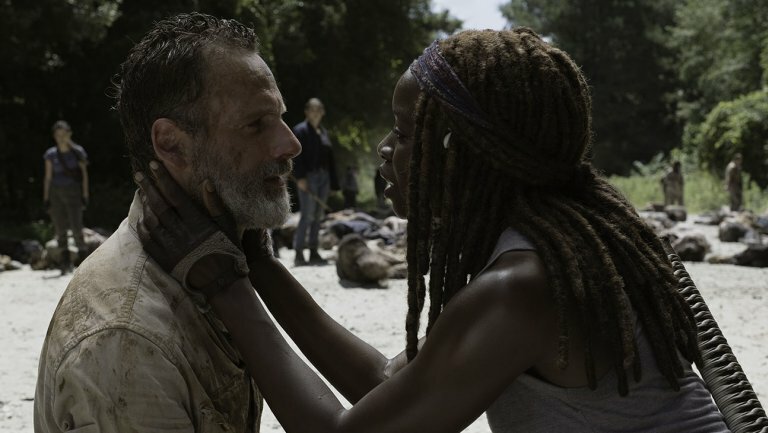 It remains to be seen how the rest of this season will play out with the time jump, but at least fans can take comfort in the fact that Rick Grimes is still alive. If anything, people were more pissed about how Rick could miss several years away and the prospect of him starting a new life with Jadis. Eww. Of course, this sets up the constant wondering if he will return to the series, but it is better than seeing him ripped to shreds by walkers, right? All in all, there were amazing performances across the board and the hope that Rick will someday reunite with his family.